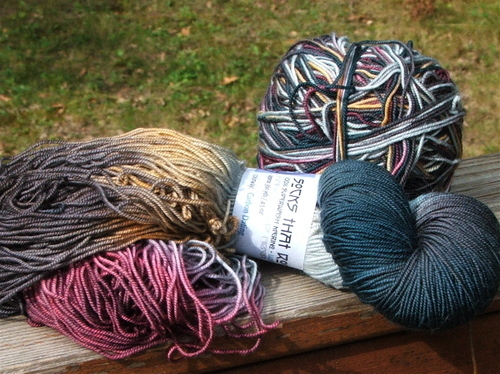 Yarn: Louet Gems Topaz, 100% superwash merino worsted, 5 or 6 skeins of each color. Needles: Knit Picks Options and Harmony circs, US#7. 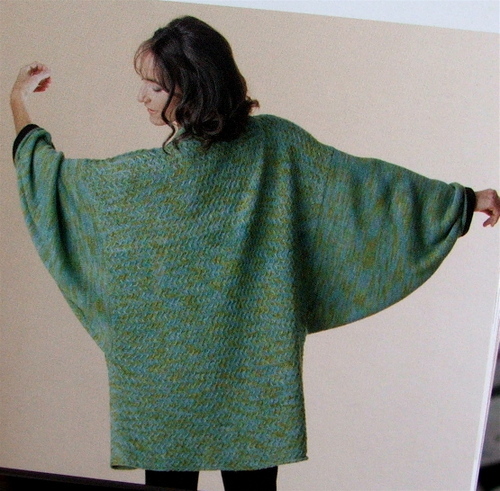 Pattern: My design, based on the fundamentals of the kimono sweaters in Kimono Knitting by Vicki Square. 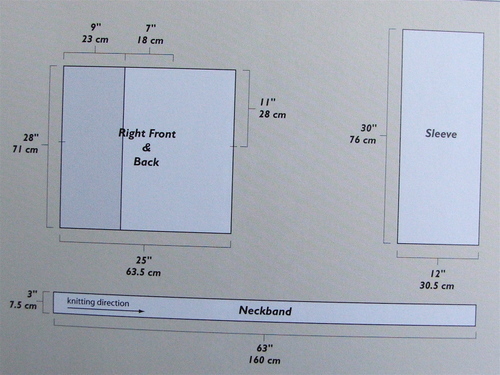 Easy-peasy, no fitting, everything is a rectangle. I made the sleeves have snug cuffs because standard kimono sleeves would have defeated the idea of a warm sweater -- drafts, people! Progress photos at my Ravelry page. 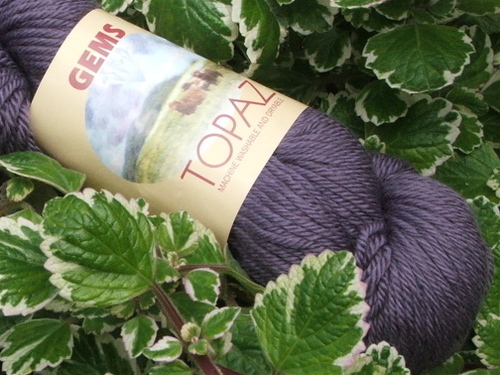 The Louet Topaz is a nice enough yarn, rather loosely plied and therefore prone to splitting. I suspect it will pill, too, since it is so soft. But the sweater is done and comfortable and warm and I am happy. Shawl pin purchased from some unremembered vendor at Yarnover 2009. "Pringle of Scotland has commissioned artist David Shrigley to create a humorous short animated film about life behind-the-scenes at Pringle to celebrate the brands return to Milan Fashion Week. "The animation, showcased during Pringle of Scotland's menswear show in Milan on 18th January, depicts the making of jumpers and cardigans over the past 195 year history of the Scottish brand." Found via modeknit's tweet yesterday. Yes, there is knitting going on here at Chez Kat™. No, it is not ready for prime time yet. I had a very happy Sunday. 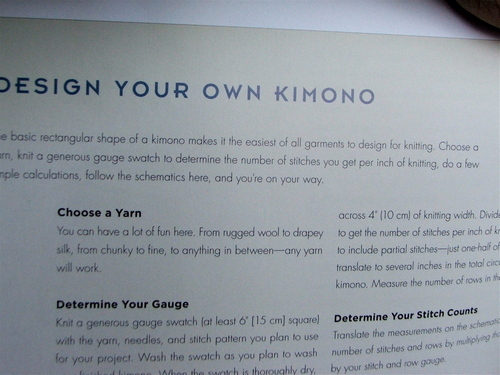 I picked up all the stitches for the sleeves on the kimono sweater. That's a set of $10 speakers Smokey picked up a while back. I committed to provide the recorded music at a library event next month, and I wanted to test them with my iPod. All systems go so far. I really don't know why it took me a week to work up the gumption to do this little task. I don't mind picking up stitches, although knowing I would have clear off the dining room table to have a place to work was a little daunting. I picked up the all the stitches for each sleeve on its own needle, then decided I should count them to make sure that, 1, I had the same number of stitches for each sleeve, and, b, that I had picked up the same number on front and back. (The sweater, except for the fact that it is a cardigan, is perfectly symmetrical side to side and front to back. Such is the nature of a kimono [sweater].) Turned out I had nowhere near the same number of stitches in corresponding areas, so large parts had to be redone. But math and counting and a wee bit of measuring -- and remembering that 5 rows need 7 picked-up stitches -- saved the day. Each sleeve = 100 stitches. Now I just need to knit the sleeves, which is perfectly mindless knitting for the first two-thirds or so, then lots of decreasing down to rolled-back garter cuffs. It is entirely possibly that I may get to wear this sweater before the snow melts. The Stones have always been one of my favorite bands, ever since I was in high school in the 60s. For a time in my early 20s when I was plagued by depression, this album -- Let It Bleed -- was the only thing I could stand to listen to when I was down. On Sunday I cued up (queued up?) all the Stones music on my iPod and rocked out whilst picking up stitches. It was highly enjoyable. #2 Son was here on Saturday and Sunday. He and Smokey spent a fair bit of time out in the garage swapping out new tires on his car and attempting to install a new exhaust system. But they took a little break to fix my office chair first. For some reason the seat of the chair has been unlevel for several months. A few weeks ago I realized that sitting askew has been part of the reason for my chronic back pain. My resident fix-it experts to the rescue; I had looked under the chair myself and found nothing that looked like I could fix. While they had the chair upside down, they cleaned the animal hair and other snarf out of the wheels. Snarf that included a piece of yarn. Unbelievable! Leavin' on a jet pl--, er, van. We are leaving on Wednesday for the annual camping trip in the Big Horn mountains of Wyoming. I have not started organizing the camping gear. I have, however, gotten all my knitting projects ready. 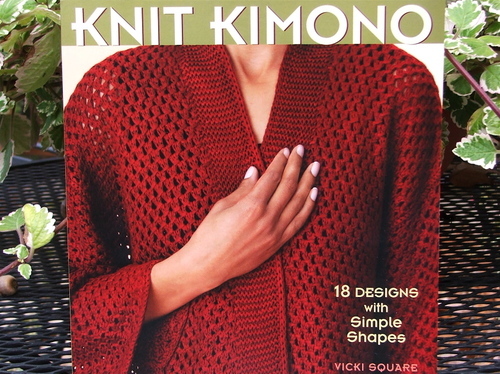 The big project is to finish the kimono sweater that I started in November 2007. The back is done. 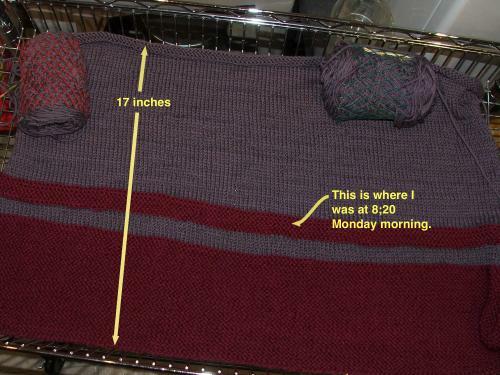 Here are the two fronts, being knit more or less simultaneously, each on its own circ. The red is actually maroon; the grayed lavender is accurate in the photo. The fronts should go fairly quickly (I hope), but the sleeves are enormous. Still, if not now, when? It's a good mindless project and I'd love to be able to wear it come fall. It has been in time out since September or so, when I realized I had been so busy counting rows for the sleeve increases that I had passed the spot where I should have begun the striping. You can see that I started it anyway, but it is not right. I need to sit down with a pencil and some graph paper and chart out how the increases and striping work out; then it will be a breeze to finish. 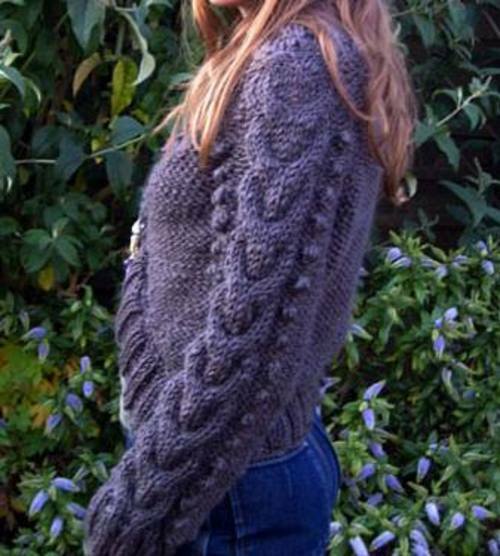 I was planning on making this a knit-in-the-round saddle shoulder sweater, a la EZ, but I may just do a seamless yoke. Depends on how ambitious I am when I reach the point to join the sleeves to the body. It knits up wonderfully fast. I have two more balls of the Gedifra yarn and am hoping the length comes out right. Angie told me about Faroese shawl construction and Myra Stahman's book on the subject when I complained last summer about how traditional triangular shawls always slide off. Cindy's Scrap Shawl, a make-it-up-as-you-go design, looked like a lot of fun to knit. So I combined the ideas and cast on with some Cascade 220 that has been marinating (and breeding) in the stash for three or four years. Thank you both! This is a fun project. 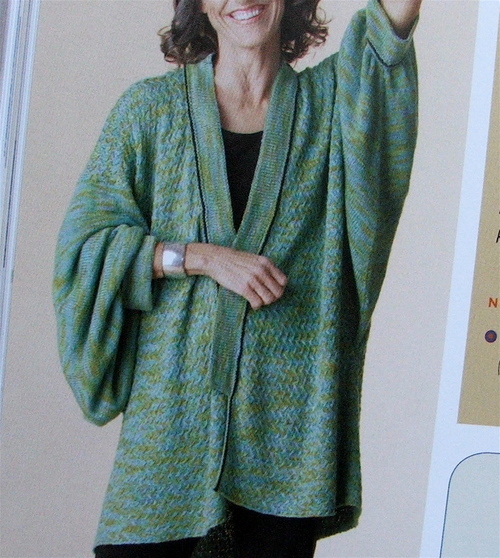 I don't know if I will actually wear it in public, but I wanted a super-warm shawl to wear at home next winter. This will fill the bill nicely. Of course, there will be some socks OTN, too. I'll finish the Indian Corn socks. and I am itching to cast on with it. 325 yards of Fleece Artist BFL Socks, 80% superwash blue face Leicester/20% nylon, and totally yummy to the touch. The part that looks fuschia in the photo is actually darkish red; the whole thing is darker than it looks here. I won this from Tammy in her latest contest, wherein she asked her readers to tell her about their favorite books. Thanks, Tammy! That topic is right up my street. Two-day knitting retreat. 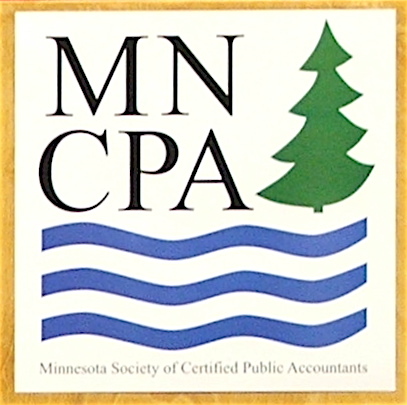 With CPE credit. 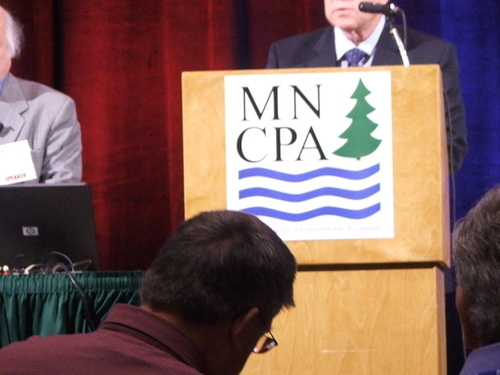 While others were listening to the speakers and following along in their (>5 pounds) 3-ring binder of speakers' handouts and making notes in the margins and highlighting the most important points, what was I doing? Listening closely. And knitting. That is the back of my kimono sweater, 140 stitches wide. The first thing I did during the Monday morning keynote session was frog half that narrow red stripe to fix some wonky stuff. Overall I am pleased with my progress and reluctantly realizing this sweater requires a lot of knitting. Onward! * Internet cafe = a couple laptops on stand-up tables. First you have to break some eggs. After much e-mailing back and forth and visiting of yarn shops and discussion about color and softness on the skin, I bought yarn and started knitting. Swatched, washed same. Gauge = happy. Knit the back. Sent it to her to check on the sizing. Received request for additional length. Time passed. They broke up. Sadness. Indecision. Should I still knit the sweater for her? Um... no. The project stalled, never to be completed, while I pondered what to do with the yarn. It wasn't suitable for charity sweaters -- too expensive, too soft/unlikely to survive hard wear, plus the machine washability, something I specifically looked for for this sweater, would not be useful in Mongolia or Afghanistan. I had combined two strands of the worsted-weight Gems with one strand of Socks That Rock in the color Carbon Dating to achieve the gauge and tweedy nature of the yarn called for in the original pattern. I was extremely pleased with the result; too bad it wasn't gonna happen now. I pondered incorporating the STR into my own sweater but eventually decided against it. This yummy stuff is now on the needles for a Baby Surprise Jacket for a coworker's possibly-yet-to-be-conceived baby. But there wasn't enough of the Gems for a sweater for me. What to do, what to do? 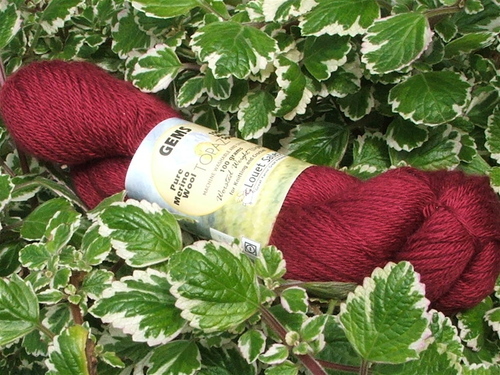 Exactly the same yarn in a gorgeous garnet that -- to my eye at least -- would go very well with the heathery grape Louet Gems I had. Sold! Now the problem was the pattern. Eventually I decided I wanted a big ol' wrap-myself-up-in-it kind of sweater to envelope me when the winter winds blow and the house is chilly. 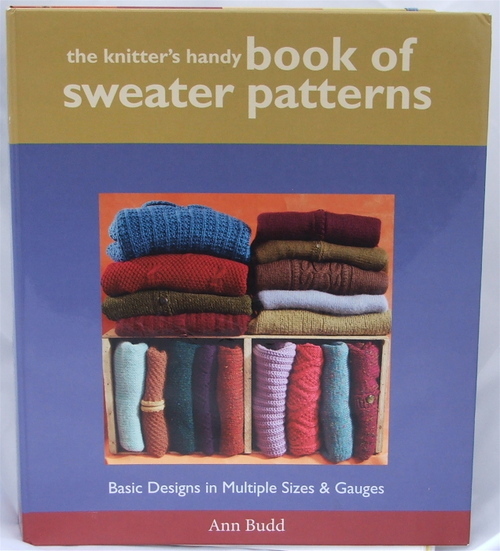 At first I assumed I would use a basic pattern from Ann Budd's The Knitter's Handy Book of Sweater Patterns; specifically a shawl-collared cardigan. I pondered how best to combine the colors and decided that the lower half of the body and sleeves would be garnet and the upper half grape and that there would be some possibly Fibonacci-type stripes at the transition. So it was settled: all that remained was to determine proper size and stitch count, wind the skeins into balls, and cast on. As soon as I had finished the fund raising knitting for the library that I had committed to over the summer and early fall, this sweater would be the next thing on my needles. And then there was the Red Scarf Project. That took some time, too. In the interim I toyed with instead using Norah Gaughan's tilted duster pattern from the latest IK but eventually decided that its construction, clever though it was, might be difficult to adjust for proper sizing and flattering fit for my ::cough::ample curves::cough:: I also wasn't quite sure how it would work in two colors. Somewhere in the interim I saw and immediately ordered this book. What? you say. Kimono are nothing but rectangles sewn together. Where is the knitting joy in that? But my favorite kind of knitting is the mindless kind. Miles of ribbing? Bring it on! Pattern stitches? Boo, hiss. Oceans of stockinette? Sheer bliss. But the real appeal is deeper than that. I found in college that I had a deep love of Japanese art. Prints, graphics, whatever, their utter simplicity and elegance spoke to my soul in unexplainable ways. They just felt... right. 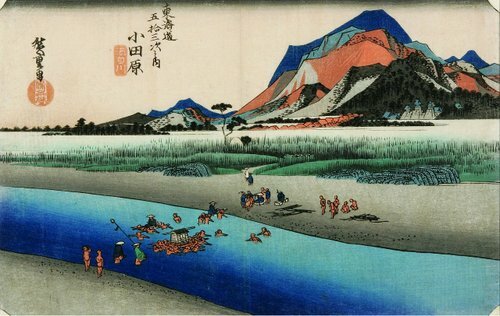 Hiroshige and Hokusai in particular were a delight to my eye. This love of Japan expanded for a while into everything Japanese, but after we hosted a Japanese foreign exchange student for five months in 1988 I found that I had some serious problems with certain aspects of Japanese culture. 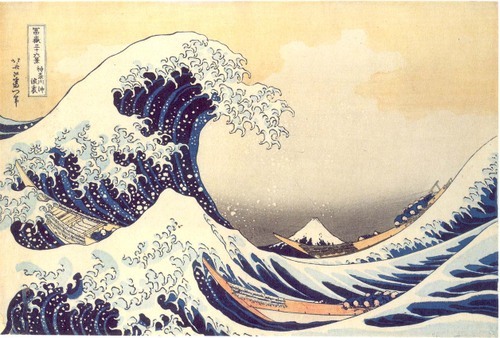 My professor for various Chinese and Japanese art history classes had summed up Japanese art as "profoundly superficial," which is wonderful in a visual medium but as a value system? It sucked rocks. Perhaps it was just our student; who can be more superficial than a teenage girl? But the visual appeal has remained strong these 20 or 30 years. 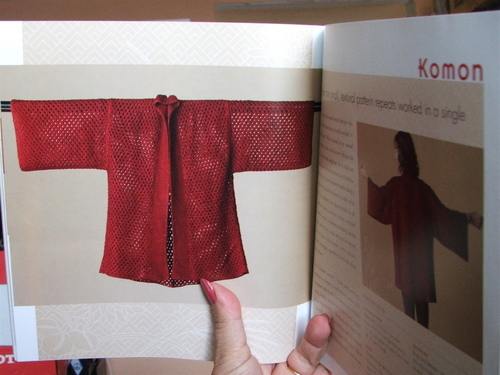 Even though the garments in this book had apparently little in common with the beloved Japanese prints of my college years, they shared that same elegance and economy of form. And they would be simplicity itself to fit. The author also included a 2-page section just for me. NaBloPoMo = National Blog Posting Month. I'm on my way on that, too!